Jessica Cushard is an experienced litigator working in the defense of claims of negligence, including general liability, personal injury, and a particular emphasis in professional liability. Ms. Cushard has a demonstrated history of defending health care professionals in claims of professional negligence. Ms. Cushard handles all phases of litigation, from pre-suit investigation and pretrial discovery to settlement negotiations and trial preparation. She uses her substantial trial experience to provide a client-centered approach to liability defense to meet the legal needs of her clients. 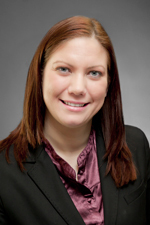 Ms. Cushard joined Hinshaw & Culbertson LLP in September 2012. Previously she was for three years an Assistant State's Attorney for Winnebago County, ending her prosecution career in the felony narcotics division. She worked with law enforcement at all stages of a narcotics investigation through obtaining search warrants, to arrest warrants; then following through with prosecution through pretrial motions and jury trial. Ms. Cushard had also previously spent time as the prosecutor in Drug Court and the Therapeutic Intervention Program, specialty courtrooms designed to transition those with addictions and mental health diagnoses back into productive, healthy living. In addition, Ms. Cushard was also assigned to the elder abuse unit, which focused on aiding law enforcement in the investigation of crimes against the elderly, and then following through with prosecution of those crimes. During law school, Ms. Cushard was a legal intern in the Cook County State's Attorney's Office. Ms. Cushard's law school accomplishments include having been a member of the Dean's list. She participated in the University College of Dublin Exchange Student Program in the spring of 2007. Secured a defense verdict on behalf of clients—a physician and large healthcare system. Plaintiff sought non-economic damages of $1.75 million, alleging Defendants failed to initiate appropriate DVT and PE prophylaxis after a skin graft operation and prematurely discharged him without such prophylaxis, resulting in Plaintiff's decedent, age 56, dying from a pulmonary embolism. Ms. Cushard lectures at the request of her clients on many topics, including legal issues facing the health care industry and tips for avoiding common professional liability pitfalls. Ms. Cushard is an avid animal lover and enjoys spending time with her two dogs, Cooper and Watson. During her time as an Assistant State's Attorney, Ms. Cushard worked with the Rockford Police Department's Rockford Youth Police Academy, putting on mock trials for the youth participants. While she was in law school, Ms. Cushard volunteered as part of the International Human Rights Law Institute. While a senior in college, Ms. Cushard was a member of Phi Alpha Delta, a pre-law academic fraternity, acting in a leadership capacity to provide mentoring for underclassmen and expand Phi Alpha Delta resources on campus. Ms. Cushard provides pro bono services to the Winnebago County community through Prairie State Legal Services in the areas of Domestic Violence Orders of Protection and Guardianship for disabled adults.